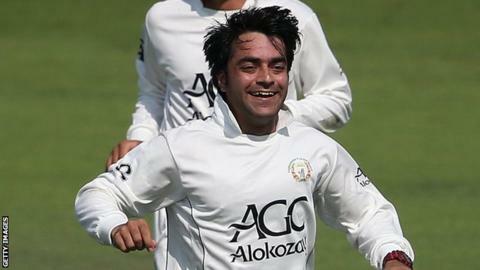 Rashid Khan's five-wicket haul has left Ireland struggling after two days of their Intercontinental Cup game against Afghanistan in Greater Noid, India.. The teenage leg-spinner wreaked havoc with the Irish line-up, taking 5-54 as Ireland collapsed from 123-1 to 170-7. Andrew Balbirnie (62) and Ed Joyce (45) shared a second wicket stand of 117. Earlier, Afsar Zazai scored his maiden first-class century with 103 not out, as Afghanistan piled on the runs, scoring an imposing 537-8 declared. Captain Asghar Stanikzai added 35 to his overnight total before eventually being dismissed when beaten by a turning delivery from George Dockrell and stumped by Niall O'Brien for 145. Zazai benefitted from a reprieve by the umpires when he edged a Peter Chase delivery to Niall O'Brien - the umpires uncertain whether the ball had carried. He went on to share a ninth-wicket partnership with Dawlat Zadran, before the Afghans called a halt with two of their wickets still intact. Ireland suffered an early setback with the early loss of skipper William Porterfield for six, one of four lbw decisions to go in Afghanistan's favour. Mohammed Nabi was at the centre of controversy as he claimed a catch at second slip after appearing to pick the ball up off the ground after dropping an Andrew Balbirnie edge. Balbirnie struck nine boundaries in a fluent 62, but his dismissal by Zahir Khan opened the door for Rashid Khan to weave his magic. Ed Joyce, Niall O'Brien and George Dockrell all went lbw to the teenager, while Gary Wilson was caught behind. The final wicket to fall was Paul Stirling - batting at the unfamiliar position of eight after being off the field with a hand injury - who was bowled by a superb delivery from Rashid. Ireland will start day three on Thursday 367 runs in arrears, requiring another 217 runs if they are to avoid the follow-on target. Intercontinental Cup table-toppers Ireland are 19 points clear of the second-placed Afghans. As things stand, the team finishing top of the Intercontinental Cup - which is played over two years between 2015 and 2017 - will face the lowest-ranked Test side (currently Zimbabwe) in 2018, with the winning team earning Test status. Afghanistan and Ireland both have two matches left after this game - but Ireland have the tougher remaining fixtures, against the Netherlands and Scotland, while Afghanistan will take on Hong Kong and the United Arab Emirates. The International Cricket Council (ICC) has agreed in principle to a structure which would see two teams - likely to be Ireland and Afghanistan - granted Test status, but this is set to be decided at the next ICC board meeting in April, before being ratified at its annual general meeting in June.